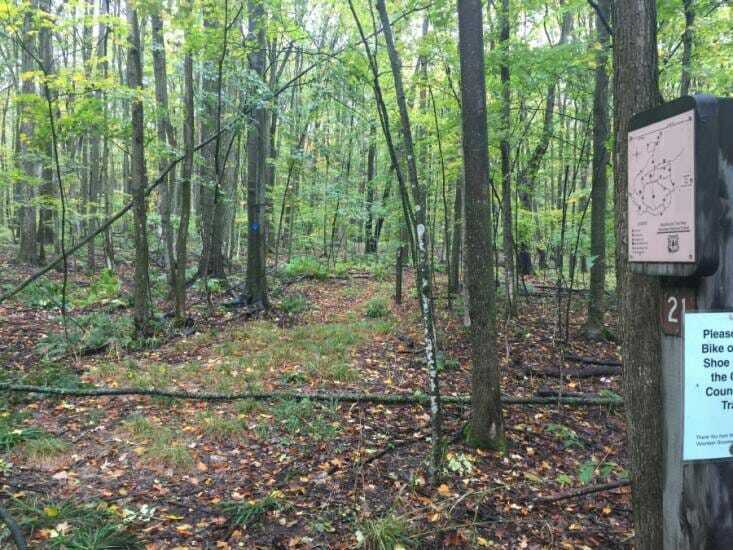 A 25 mile multi-terrain, multi-season hiking, biking, summer trail, that transitions into a groomed classic cross country ski trail system in the winter. It’s located at the foothills of Caberfae Peaks, and meanders into the National Forest. The entrance is located on 38 Mile Road, 1 mile west of Caberfae. This trail is maintained by local volunteers in cooperation with the National Forest Service. This is a great trail for those looking to explore the heart of the Manistee National Forest. The vast looped trail network allows you bring only one vehicle with no shuttle vehicle needed. You can create an overnight camping/hiking trip by creatively intertwining the trail networks. There are easy, moderate and difficult trail segments throughout the region. Access the trail via the trailhead off of 38 road. All trails are well marked and trail intersections have marked maps for easy navigation. This trail is open in the winter months for snowshoeing and XC skiing. New in 2018, the trail is now a signed connector with winter seasonal access from Caberfae. Following their golf course cart path the trail connects to marker #21.